Remington Park community is sold out and is not in active development by builder. If you are interested in Remington Park or similar new home communities, contact us today! Our agents are very familiar with new and newer construction in Suffolk, and can identify resale opportunities in Remington Park, as well as builder inventory available in nearby or similar communities in Suffolk. To view 11 more pictures, interactive maps and the full, detailed description of the Remington Park community, please Login. Condo living feels right in a classy townhouse at Remington Park. Each new home here is made to help induce a low-maintenance lifestyle. 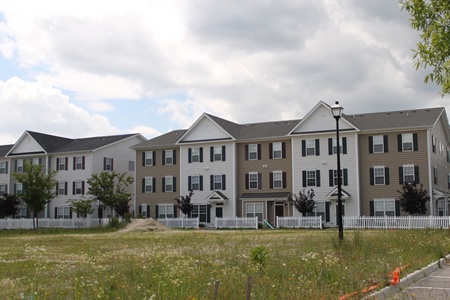 This development is located in Suffolk, VA, not far from Interstate-664 or the Monitor-Merrimac Memorial Bridge-Tunnel. This is the perfect spot for those wanting to get to military bases like Coast Guard Base Portsmouth, Joint Base Langley-Eustis or Norfolk Naval Shipyard. Buying a condo feels right, even from the start. With good looks, solid construction and nice price, it’s easy to see how every townhome here appeals to modern homebuyers. Condos range in size from 1,600 to 1,750 square feet. In Remington Park, each new home includes professionally landscaped front yard with sod, eat-in kitchen, Kenmore appliances, cathedral ceilings, custom designed closets, wall-to-wall carpeting, insulated metal entry doors, heat pump and more. Life in Remington Park is literally a day in the park for townhouse owners. Besides having the grounds maintained and living in a virtually maintenance-free condo, residents get on-site amenities. Children will enjoy the modern playground. Neighborhood gatherings can go off without a hitch in the covered pavilion. Community soccer games will be a blast on the large recreation lawn. Get more than just a new home when you move in here, get a whole new life. Suffolk is the ideal vision of suburbia at its finest. Virginia residents have no shortage of things to do on this side of town. For shopping, dining and entertainment, head over to the Harbour View Station Town Center. Golfers can tee up on courses at the Riverfront Golf Club and the Sleepy Hole Golf Course. Bennett’s Creek Park affords scenic views of the water and offers fishing, crabbing and boating. When choosing a new home in Hampton Roads, select one that can provide the perfect breeding ground for joy. While a townhouse can’t bring happiness, buying one can certainly elicit smiles. This condo complex surpasses expectations at a price homebuyers can live with. Come home to Remington Park and experience the difference. Send me more information about communities similar to Remington Park. Our agents gladly offer FREE property tours of Remington Park, Suffolk and homebuyer consultations to all serious buyers.